Samsung can boast that it has two of the best Android smartphones on the market to date: the Galaxy Note 4 and the Galaxy S5. Though both devices present many similarities, there are key differences, which are apparent when comparing them in-depth. Today, we're taking a look at both devices to see how they match up in our Galaxy Note 4 vs Galaxy S5 comparison. Obviously the Note 4 is larger, and heavier than the Galaxy S5, so no need to delve deeper into comparing dimensions. What counts here are the choices made in terms of design: Samsung opted for a perforated soft plastic backing on the Galaxy S5, while the Galaxy Note 4 is like the Note 3 in that they’ve incorporated fake leather. This time though they omitted the fake seams. The Note 4 has an aluminium frame, while the Galaxy S5 has a fake chrome frame that resembles the rims on a souped up car. Also, the Note 4 doesn’t have USB 3.0 like the Galaxy S5, which some are a little irked about. Obviously, the Note 4 has the built-in S Pen, and also holds the heart rate monitor and finger scanner, like the Galaxy S5. So both have their advantages, and disadvantages, but the Note 4 is a bit of step up! In terms of performance, the Galaxy Note 4 edges out the Galaxy S5 thanks to more RAM and faster processor. In practice, the Note 4 is just a little nippier at opening apps and flicking between windows, but this isn't to say that the S5 isn't a strong performer in its own right. This is possibly where the most important distinction, and there is basically just one crucial element that divides these two Android titans: the S-Pen. The Galaxy Note 4 arrives with its very own stylus (known as the S-Pen, of course) and provides some features for it to extend it beyond a simple gimmick. On the contrary, the S-Pen can be very useful. Aside from being used as a pin-point accurate alternative to your finger, the S-Pen's dedicated features include Action Memo, Smart select, Screen write and Image clip. Action memo lets you hand write messages and convert them into useful actions, such as handwriting a phone number and then creating a contact with that number. It’s extremely clever technology, so try to remember to use it. Screen write lets you write on top of a screen capture, which you can then save and share. Image clip is like a photo editing “magic wand” tool, allowing you to capture a specific on screen shape. And Smart select, which I think is possibly the most useful feature, basically lets you capture anything you want on screen, be it an image, some text, a URL, anything you want, and then share it in a flash. The Note 4 is even capable of sending the URL link of the item you have screen-captured using this method. Impressive. The Galaxy S5 cannot compete in this area in terms of hardware and software capabilities. You can do all of the S-Pen actions in roundabout ways with third-party apps. But it’s just not the same. The Note 4 and S5 aren’t that different in terms of camera technology, both house 16 MP cameras which shoot in 4K. However, Note 4 is slightly better than the Galaxy S5 in this area. This is no small feat given that the S5 has an outstanding camera, but in most cases the Note 4 looks a little richer, and less "washed-out" (if I can use that to describe the S5 camera). The Note 4 also has a significantly better front-facing camera. The other clear advantage the Note 4 presents over its older sibling is optical image stabilization. I can’t count the number of photos I’ve had ruined because my hand wasn’t perfectly steady. Don’t get me wrong, the S5 is usually completely capable of ensuring steady shots (and was every time in my test), but the chance for them to be ruined by blur is that much more apparent on the Galaxy S5. Check out the reference images below. The Galaxy Note 4 is always on top, with the Galaxy S5 at the bottom. Samsung Galaxy Note 4 vs LG G3: do we have a new QHD display champion? The Note 4 has a larger battery life than the Galaxy S5, at 3,220 mAh compared to 2,800 mAh. Theoretically you might expect this means that the Note 4 has superior battery life, but the Note 4’s QHD screen compared to the Full-HD screen of the S5 has to be considered also. Despite the higher-quality screen, faster processor and more RAM, however, the Note 4 still beats the S5 for battery life. Samsung has done well to ensure that the screen does not crush the battery life as you may expect. Both the Galaxy Note 4 and Galaxy S5 also house the same range of battery saving options, and turbo-charging feature, but the Note 4 is believed to get to the 50% charge mark a little faster than the S5. Since the Galaxy S5, Samsung has been able to refine its hardware and software technology. Some features and functions are present on both devices, like mentioned above with the heart rate monitor and finger print scanner, but there are new ones on the Note 4, like a UV detector. Both Samsung smartphones have been designed for different audiences, but the superiority of the newcomer is undeniable. In comparison, the Galaxy Note 4 has more processing power, a better screen, longer battery life, better cameras, and, of course, the S-Pen. All that’s left to consider is the price! 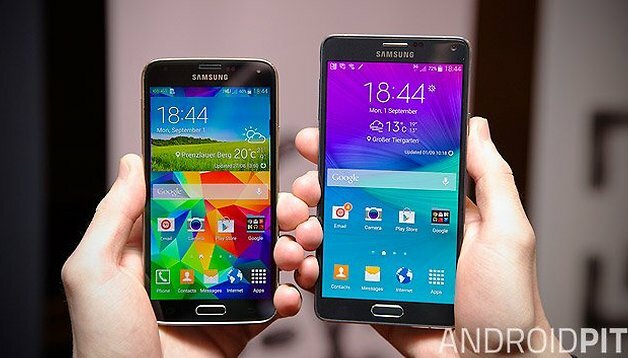 Now that you've read our Galaxy Note 4 vs Galaxy S5 comparison, which device do you prefer? I'm very Curious what you find lacking about the camera? It's about the best I've used. My biggest gripe is that it's not waterproof like the s5. Because of what the Galaxy Note 4 does and what it represents the price is well worth it. The Galaxy Note 4 is the GOLD standard of technology today the Worldwide global proven product nothing else compares or matters period. If you love the any of the Note series, you should definitely love this one!! Knox maybe the only obstacle keeping me from getting this bad boy. I'm still in love with my custom rom'd Note 3. What do you mean, the Note 4 specs should have been the Alpha's?